Sporting clubs across the Northern Tablelands, including the Bingara Sporting Club, will soon have the latest in life saving technology to help with cardiac arrest, thanks to $16,900 of NSW Government support provided under the new Local Sport Defibrillator program. 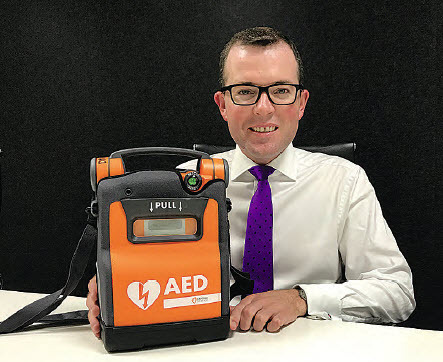 Member for Northern Tablelands Adam Marshall today announced that 13 defibrillators would be purchased and retained at sports grounds across the region, helping to provide lifesaving first-aid in the crucial first minutes of cardiac arrest. “Research shows that quick action in the first few minutes of cardiac arrest can improve survival rates by as much as 75 per cent,” Mr Marshall said. “The NSW Government’s Local Sports Defibrillator Program has split the cost of the purchase and training for a defibrillator, easing the burden on clubs who are looking to protect players and spectators. Mr Marshall commended local clubs and councils for their initiative in applying for funding under the program. “Most applicants haven’t seen a cardiac arrest locally, but want to put aside the constant worry of ‘what if’ a medical emergency occurs,” Mr Marshall said. “Clubs have identified older players and extreme temperatures as potential risk factors that could lead to a heart attack. With a prominent location at the centre of local sporting activity, medical attention can be sought in just seconds, while an ambulance is called for further treatment.